An upright, irregular, suckering shrub. The spiny foliage is a lustrous, dark green. 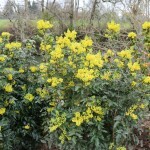 It blooms in the spring with 3" long racemes of bright yellow flowers. 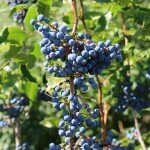 The fruit is dark blue, almost like small grapes. It is sour, but safe to eat. Grow in full sun to part shade in moist, organically rich, well-drained soil. It responds well to hard pruning. This is the state flower of Oregon.